REM Clover Stylists Stool. 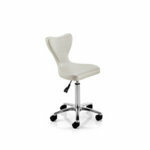 Available in a large range of colours from the REM fabric range (Please Use The Drop Down Box To Choose Your Colour). Dimensions: Height 52 - 66cm, Base Width 50cm, Seat Width 39cm, Seat Depth 33cm, Overall Base Depth 50cm.